People wear daily or special costumes in line with the reasons behind the particular dance. Please visit the costume and finery section of this site for further information. In Turkey folk dance is invariably accompanied by musical instruments. (Please refer to the music section) In some regions, women perform also folk dances to the accompaniment of folk songs. Folk dances are named after their creators, geographic regions, or the natural events or stories they relate. 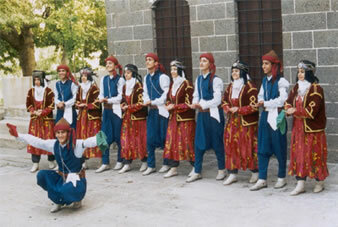 Folk dances may be divided into those that describe the relationship between man and nature, those that deal with rain, mist and rivers, those that describe plants, those that are defined as numbers, those that describe the relationship between man and animals and those that take social events such as fighting, war, love and courtship as their subject matter. Then there are those that reflect the ceremonies performed when a young man is about to go off to do his military service. There are dances about agriculture, the harvest and damaged crops. Other dances describe different occupations, such as shepherds. Men can perform dances that mirror the everyday lives of women. Then there are dances that describe daily tasks such as baking bread and milking, and others that describe a production procedure such as spinning yarn.